Peggy’s patriotic counterpart was Lucy Flucker, the spirited and voluptuous brunette, who in 1774 defied her wealthy Tory parents by marrying a poor Boston bookbinder simply for love. When her husband, Henry Knox, later became a famous general in the Revolutionary War, Lucy faithfully followed him through Washington’s army camps, where she birthed and lost babies, befriended Martha Washington, was praised for her social skills, and secured her legacy as an admired patriot wife. And yet, as esteemed biographer Nancy Rubin Stuart demonstrates, a closer look at the lives of both women reveals that neither was simply a “traitor” or “patriot.” In Defiant Brides, the first dual biography of both Peggy Shippen Arnold and Lucy Flucker Knox,Stuart has crafted a rich portrait of two rebellious women who defied expectations and struggled—publicly and privately—in a volatile political moment in early America. Love stories from eighteenth-century America are rare and often fragmented. Fortunately enough of the correspondence of Lucy Flucker Knox (1760¬±1824) and Margaret (Peggy) Shippen Arnold (1760¬±1804) has been preserved to trace their controversial marriages and dramatic lives. Born four years apart to wealthy parents in pre¬±Revolutionary Boston and Philadelphia, Lucy and Peggy were intelligent, well-educated girls. As each developed into an attractive teenager in the mid-1770s, the political ferment of the American Revolution reached the boiling point. In the midst of that turmoil, both might have married men of their privileged class and led docile, if historically invisible, lives. Thankfully that did not happen. 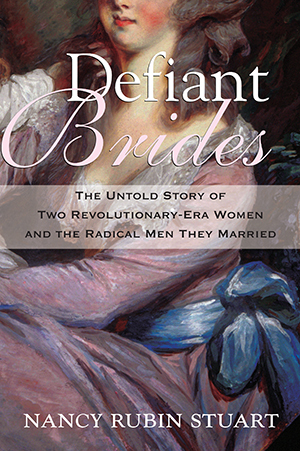 As the title of this double biography, Defiant Brides: The Untold Story of Two Revolutionary-Era Women and the Radical Men They Married, implies both teenagers bucked social convention. One married radical patriot and poor bookseller Henry Knox in 1774; the other wed the then-military hero Benedict Arnold in 1779. Coupled with the young women’s fateful marriages was their feistiness. Under different circumstances, Lucy and Peggy might have become friends. For generations, the books devoted to the Founding Fathers and the Revolution’s military leaders have dismissed both women as mere footnotes to history, either as laughable or trivial helpmates married to Knox and Arnold. A close examination of their lives tells quite a different story, revealing Lucy and Peggy as remarkably resilient women who intimately witnessed and participated in the Revolution’s turbulent course. The same spirit that impelled the annually pregnant Lucy to follow Henry Knox through the Revolution’s army camps also drove her mirror opposite, Peggy, to support Arnold’s betrayal of America and subsequently troubled life in England and the loyal colonies in North America later known as Canada. Superficially Lucy’s patriotism seems as commendable as Peggy’s treason is condemnable. Yet that is not quite fair. For all our glorification of its origins, the Revolution was not universally supported by the American colonists. An estimated one-third of those living in America’s thirteen states in the years following the Battle of Lexington and Concord doubted the wisdom of independence from the mother country. Some citizens remained Loyalists. Others, unnerved by the economic hardships of the war, hedged, declaring themselves neutralists. It was thus natural that as an enamored eighteen-year-old bride, Lucy would side with her husband, Henry Knox, to support the American Revolution. It was equally understandable that the teenaged Peggy Shippen would sympathize with her politically disappointed bridegroom, Benedict Arnold, to betray America to the British. That twinned blend of youthful defiance and dedication to their men, though a hallmark of adolescent passion in any age, drew me to research the lives of Lucy Flucker Knox and Peggy Shippen Arnold in the context of the American Revolution. At first I suspected that the two women must have met. Arnold, after all, had gallantly escorted Lucy and her toddler from New Haven in late spring 1778 to join her husband in Valley Forge. Eight months later, Henry Knox rode to Philadelphia to meet with Congress. From there he enthusiastically wrote his brother about Arnold’s engagement to the wealthy, beautiful, and accomplished Peggy Shippen. Lucy, however, had not accompanied him; then in the last weeks of pregnancy, she had remained in the Knoxes’ temporary home near the Middlebrook army camp. As their lives diverged, the two women had no other occasion to meet, although they knew about each other through their husbands. Nor have letters between Lucy and Peggy subsequently been discovered. Defiant Brides, nevertheless, traces Lucy and Peggy’s initially parallel lives, from those as smitten newlyweds to mature wives and mothers. While researching this book I found several frustrating gaps in each of set of their correspondences. Lucy rarely wrote to anyone other than her husband, and then only when separated from him during the war. Today, most of her letters are preserved in archives, especially at the Gilder Lehrman Institute and the Massachusetts Historical Society. Peggy’s correspondence from her youth and the early years of her marriage was lost, a consequence of Shippen’s decision to destroy it to protect her from accusations as Arnold’s co-conspirator. Fortunately, the Shippen family began saving Peggy’s letters after the September 1783 Peace of Paris, which formalized the British surrender. Today the Historical Society of Pennsylvania retains Peggy’s correspondence from the last twenty-one years of her life. Many of those letters also appear in Lewis Burd Walker’s 1900¬±1902 series in the Pennsylvania Magazine of History and Biography. During the Revolution, Lucy and Peggy stood on opposite sides of the political schism, one as a staunch patriot, the second as a spy; one in shabby homespun, the other in silken English gowns; one in a log hut, the second in a luxurious townhouse; unwitting counterparts who lived dramatically different lives in the service of connubial love. As women, their personal evolutions also stand in sharp relief. Subsequent to the Revolution, the exiled Peggy endured hisses and taunts as a suspected accomplice to Arnold’s treason; crossed the Atlantic three times; excused her husband’s public, often fractious enmities with peers and business associates; and, after his 1801 death, resolutely paid off his debts. During those same years, Lucy’s devotion to Knox, her legendary hospitality, the deaths of ten of her children, and her obsession with cards transformed her into a superficially formidable, but ultimately sympathetic, character. 2. Their marital styles were as significant as their political sensibilities. As the following pages reveal, Lucy, for all her patriotism and personal losses, was a temperamental, often difficult mate; Peggy, a shrewd accomplice to Arnold’s treason, endured emotional and fi nancial hardships with genteel restraint. It was my hope that their pairing in Defiant Brides would transcend the coincidence of their “defiant” marriages to reveal how lapses in one of them inadvertently highlighted admirable traits in the other. Is treason or betrayal of others forgivable if the rest of that person’s life seems admirable? Do sacrifices for patriotism--or for any other pro-social cause--excuse selfishness or insensitivities towards a loved one? To make such judgments must be left to you. My goal was to capture the lives of Lucy Flucker Knox and Peggy Shippen Arnold beyond their iconic portraits as patriot and traitor, respectively, and depict them as human beings, as vulnerable, fallible, and praiseworthy as we are today.